Mark McGwire came out on Monday night stating that he took drugs during his long MLB career, one of many who have admitted to cheating in recent times. Now, not being someone who pretends to know much about Baseball – I was however aware of McGwires magnificent achievement in breaking Baseballs season hitting record (even though in England Baseball is scarcely covered). 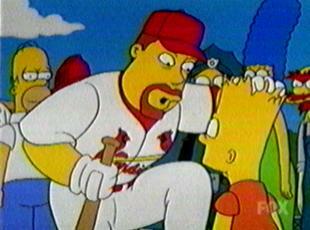 His status as a Baseball star Stateside was further reinforced to me when he popped up in an episode of my favourite cartoon; the Simpsons. McGwire and MLB carefully cultivated a wholesome image out of one of the games best known characters, marketing McGwire to millions of children who would dream about one day breaking his home run record. Yet he, like so many other Baseball‘stars’ before and after him only managed to reach the dizzy heights of sporting excellence by cheating. How can baseball recover, and what of the next generation? Baseball is clearly a sport tarnished. With its rich history; that is as much a part of American society as it is ingrained on its psyche, its carefully crafted legends, deep meaningful stories of rivalry and decades of epic battles. In one foul swoop a group of idolized individuals come along and shatter almost 100 years of brand building by MLB and its teams. How can young people believe in baseball again, how can it possibly start to regain its credibility amongst the masses. If it was upto me I would start by wiping the records from history of all the known drug cheats. Then I would move to the players who are still playing but have admitted to, or been caught out taking performance enhancing drugs. I would make them wear bright pink uniforms for the rest of their careers, so when little Johnnie turns to his dad and asks why is that player in a different colour uniform his father can say, “he’s a cheat son, therefore no matter what he does he isn’t truly accepted in our sport”. Baseball is by no means finished, but if ex heroes like McGwire keep announcing their sins to the world every few months then it has one hell of a challenge. MLB has to go back to basics and start thinking about the next generation, only then can fans start believing in the sport again and a platform from which future great stories can unfold once more.